As a girl who loves pasta, any and all types of pasta dishes are in heavy rotation in this household every week. It's just something we all enjoy (it's Cora's favorite food if you ask her, although pizza is a close second) and if we're good about it, it can be a healthy dinner option. Well, I've been craving Chicken Parmesan the past couple of days and figured I'd try my hand at making a simpler version. So here it is! If you have any questions, please leave a comment and I'll be sure to get back to you asap. Now, these are really for the chicken breast, not so much for the spaghetti noodles or heating up the tomato sauce since that's pretty self-explanatory. - Pound the chicken breast so that they're all the same thickness. I pounded mine to a 1/2" thickness. - Combine the flour, salt, pepper, and garlic powder in a shallow dish. - Flour the pounded chicken in the flour mixture, dust off excess. - Heat the olive oil in a nonstick pan on medium high heat. You'll want to pan sear the chicken so that it gets a golden crust. - Sear the chicken on both sides for about 3-4 minutes on each side. I also topped it off with more black pepper because in this house, we like black pepper. - Place the seared chicken breasts on a baking sheet that's lined with parchment paper. - Bake in the oven to finish cooking for about 15-20 minutes. - Then place the sliced mozzarella on top of the chicken and bake for another 2-3 minutes or until it's melted. 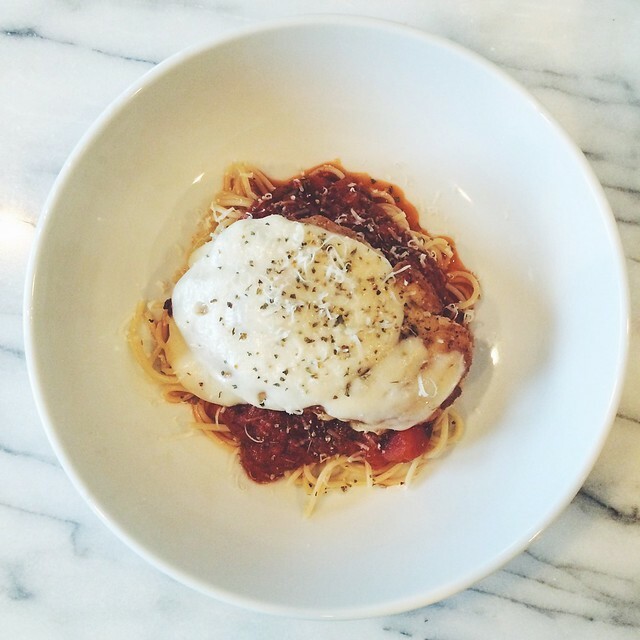 - Plate the spaghetti noodles in a bowl and top it off with the Bertolli's tomato sauce. Then top it with the chicken breast.